Last year was the first time I participated in this race. TKB and I joined the “At The Helm” team then to support our friend Mark, who has battled brain cancer, and we ran with the team again this year! The Helm family is one of the families I have known the longest of my life. I went to school with Heather (Mark’s sister) from kindergarten to graduating from undergraduate college. She's also the person who brought TKB into my life, so I guess I can blame her. Additionally, Heather taught at the university where I obtained my Masters degree! I wanted to repeat last year’s performance and hopefully be faster by 3 seconds so I could complete a 5k in under 20 minutes, but I know my legs just aren’t as strong as they were last year. My hope was to get under 21 minutes, which would be my second fastest 5k time. I found this interesting knowing that my legs were not as strong this year considering I have been doing nothing but running since mid-June training for the Chicago Marathon. Last year I was doing a lot of cross-training with swimming and biking training for my first half ironman. What was quite interesting about the race this year and last year was that I was hitting the peak of my base building for both training plans. This meant that I was doing a true test of what cycling and swimming does to my running fitness. TKB and I arrived around 7:00am at Corporate Woods. We easily found a parking spot and then left to find the Helm family. The weather was OK. It was cloudy and the rain had just stopped. I was wearing my blue singlet (to match the team t-shirts), so I was actually a bit chilly. We hit the port-a-john and meandered through some of the booths. I was a bit hungry still, so I picked up a banana and bagel. The race didn’t start until 8am. It might be a bit late to be eating this much but it turns out to be a smart decision, as I will discuss in a bit. Shane and I took off for about a mile warm-up around 7:45. The hope was to get back in time to get in the first few rows of participants. Last year I lost my sub-20 5k in the first quarter mile of the race as I couldn’t get close enough to the start line and ended up wasting time and energy dodging people. For the record, I didn't try to get close to the front either. During our warm-up I noticed a huge line of cars still trying to get into the race so I wasn’t shocked to hear that they had delayed the start of the race “a few minutes”. A few minutes turned into 24 minutes. The biggest reason for the delay was the timing company was having issues. We were told that the timing system worked but they wouldn’t be able to provide race results at the race. I’m glad I did grab a bite to eat because I would have been starving by this time. The gun finally shot at 8:24. Shane and I started our race about 10 feet back from the line. I just tried to stay behind the fast looking people so I wouldn't cause a traffic jam. 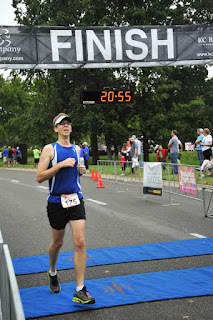 Soon after crossing the start line, I began hitting my stride. Since I'm 6'4", my stride has a long kick behind me. Unfortunately, some one behind me apparently thought I was going too slow or was shooting for a better “lane”. He crossed to the other side of me; however, he did this by going through my legs. I tripped up, but saved myself at the last millisecond. It wasn’t Gabriel Douglas pretty, but I did raise my hands to celebrate my “dismount”. My goal for the first mile was to not go out too fast. 6:45 would be optimal. Naturally, it clicked off in 6:32. There is a 60 foot incline during this mile. I could tell I was in trouble as I was already breathing hard while the other guys around me were just hopping along like it’s a Sunday stroll. Time to buckle down! Legs are burning now as I finish mile two at 6:55. There is another hill in this mile but just like before, it’s not that bad. A slight downhill and I’m trying to do everything I can to not break. Hearing cheers from TKB and the Helm and Mecham families as we double backed was awesome. I tried to wave but couldn’t. I finished the 3rd mile in 6:51. I kicked it up and ran as hard as I could, which apparently was an average 6:33 pace. I could see the clock was still under 21 minutes, so I booked it!! I knew pretty early that sub-20 was out. So the goal was to survive a sub-21. I just needed to keep the lap times under 7 minutes and I accomplished that. My original plan was to then run the course again because my marathon training plan had called for a 6 mile pace run. Well, it actually called for that on Saturday and a 12 mile run on Sunday. So instead I had planned to flip-flop the days. I was so gassed after running that 5k that I decided it was enough. I walked around for 10 minutes to cool down and take in some post-race grub. I watched TKB and Karen cross the line and walked the booths with them. Heather was running with her kids, as was Mark and his wife Valerie, so it was going to be a bit before they finished the race. The reservation time for our brunch was coming up, so TKB and I took off for the restaurant. Last year I did actually wait around for the award ceremony. Since I already knew that they wouldn’t be doing one, I didn’t mind leaving early. Either way, my time was 52 seconds slower and I got 8th place in my Age Group that time. I wouldn’t have waited either way. While I had checked kcrunningcompany.com a few times to see if results were posted, TKB and I had a busy day planned. I wasn't at my computer the rest of the day to check the results. I got a text from Heather saying “HFTC results are up. You ROCK!”. I pulled up the race results to see that I got 3rd place in my Age Group!!! I was absolutely shocked!! Of course I immediately went into the mode of comparing this to last year and played down the achievement. Sure, I got 3rd but the overall winner was in my age group (Dale Dexter), so I really got 4th. I was behind 2nd place by almost two minutes and I was ahead of 4th place by 40 seconds. So a majority of the group of fast runners that put me in 8th last year simply had something else to do. I’ve finally resolved that I showed up and I got that position in my own right. I still fought through plenty of pain and mental anguish to finish. I was the 3rd fastest age grouper that day, and that is still amazing. Actually, I was waiting for the race to start... apparently 30 minutes ahead of schedule. Check about 15 seconds in. I'm on the other side of the street. Look for the white visor and blue singlet/tank top. It's ok to laugh. I always do.